There may be a lot of choice out there, but we relish the opportunity to provide your guests with a fresh and dynamic culinary experience. Our customizable menu provides you with the opportunity to pick and choose the options that will make your meal something to be remembered by all of your guests. Choose between plated or buffet service and don't forget to match your favorite pizza with custom martinis or paired wines for that extra touch. Appetizers, salads, pizza, and desserts are all available! Shaylene enrolled in Associazione Verace Pizza Napoletana for her training to ensure that Martini & Pizza only offered the very best authentic Neapolitan Pizza. This is the only AUTHENTIC Pizza school in Italy. It was important to Shaylene that she attend school in Napoli, Italy and learn the historic trade in the very place Pizza was born. Not only did she learned the technical side of pizza making, but was chosen to work in one of Naples premiere pizzerias as she honed her craft at the art of true Neapolitan Pizza making. Shaylene is the second Canadian female to pass the course and is now passing her gift to you with every mouth-watering bite of authentic wood fired pizza. Shaylene's certification test from AVPN. 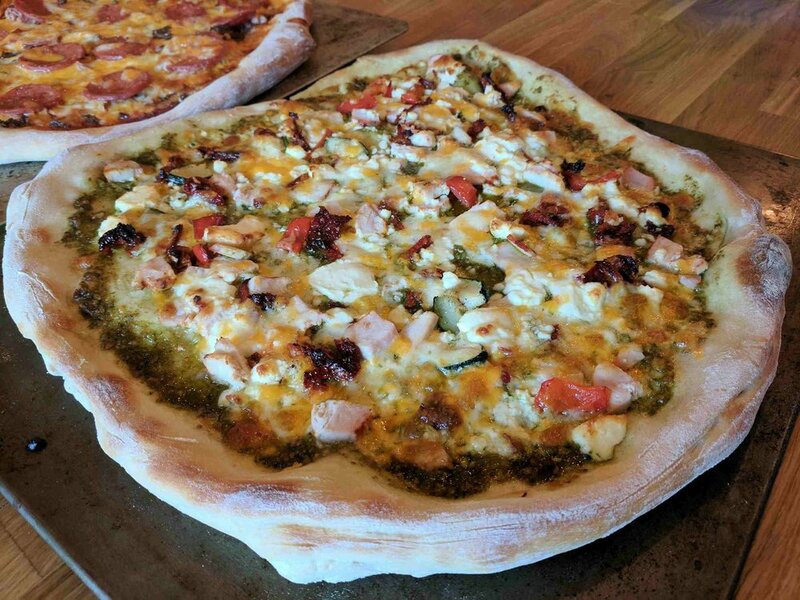 The idea of Martini & Pizza was born in August of 2013 as Shaylene and her husband were travelling throughout Africa. Although not necessarily known for its pizza, the couple fell in love with the flavours and the authentic cooking methods as they toured the continent. It seemed that whichever country they were in, delicious wood fired pizza could be found. Upon returning to Canada they couldn’t get the idea out of their heads; they needed to open a pizzeria and bring Authentic Neapolitan pizza to Canada in a way that Canadians have never experienced before. After weeks of talking and trying different local pizzas they knew there was a market that was missing. Pizza catering! It was time to bring amazing, custom made pizza to Canadians in venues and establishments where such an option has previously never existed. And Voila, Martini & Pizza was born.